PPL is a leading accelerator company in the world! for inquiries about analysis service. It has been a 21 year journey since PPL was established as an independent entity from Ritsumeikan University. That journey continues with the building of our new laboratory at Anamura-cho, Kusatsu, Shiga in Japan. The new facilities, completed in 2017, will allow us to reach new heights in MIRRORCLE development, and continue to provide world class customer solutions. We appreciate your continued support and look forward to working with you in the future. Our trademark series of electron accelerator products cover a wide range of applications for non-destructive inspection. Electron beam accelerator "MIC" can provides high energy X-ray CT of large objects. Or use Tabletop synchrotron "MIRRORCLE" for more laboratory or industrial production applications. Both products provide extremely high definition results. Our non-destructive inspection services are highly valued by the automotive, aerospace and construction industries. We made MIRRORCLE ANALYSIS CENTER as our easy to use point of contact for our NDE, NDT, and other analytical services. As inventor of the world's first tabletop storage ring synchrotron MIRRORCLE, founding PPL to grow and promote MIRRORCLE to the world has been the fulfillment of a lifetime goal. 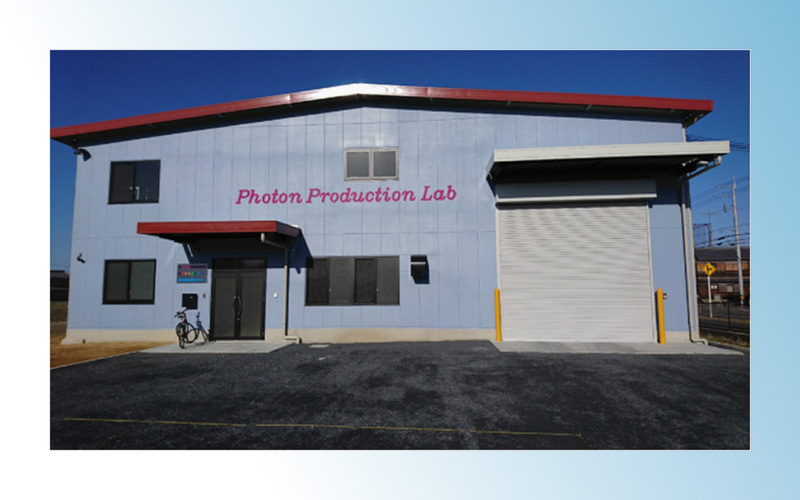 PPL is an exceptionally rare company with its specialization in advanced electron accelerators. With the conventional electron accelerator manufacturing industry in decline, PPL has grown, with the goal to lead the electron accelerator industry. Once again we appreciate your continued support. PPL also has many peripheral activities that also support the development of MIRRORCLE. Starting originally as a core member supporting Ritsumeikan University Next 21st Century COE initiative and the Synchrotron Light Life Science Center. PPL continues to develop MIRRORCLE specific beam lines such as XRD, XAFS, SAXS, FTIR etc. With best wishes for a "MIRRORCLE" future! Electron accelerators currently in circulation are a linear accelerator called LINAC. In LINAC, accelerating cells are linearly arranged and accelerated by a lamp electric field. Since it is high frequency electric field can swing from + to -. If the time when the electron accelerated by + electric field arrives at the next cell is again +, the electron continues to be accelerated continuously. On the other hand, MIC is a microtron-type electron accelerator developed by us and is the only one technology. Although there is only one acceleration cell of MIC, it is set so that when the electron which circulated in the magnetic field reaches the same acceleration cell, it becomes the acceleration phase again by making electrons circle by the magnetic field. Compared with LINAC, MIC is smaller, has high acceleration efficiency, is 100% (70%), has high drawing current value 300 mA (100 mA), dispersion of electron energy is small 1% (5%). Numbers in parentheses are numbers of LINAC for comparison. MIC is currently mainly used as an X-ray source for high energy X-ray CT, but since it is a large current, there is output of 10 MeV 25 kW, electron beam sterilization . A small 1 MeV 5 kW device is used to sterilize PET bottles. Tabletop synchrotron "MIRRORCLE" generates high intensity synchrotron radiation with continuous spectrum from EUV to gamma ray region like large synchrotron radiation and can be used for various analyzes. Unlike synchrotron radiation, X-rays of over 100 keV can be generated, and the focal size of X-rays is 20 ﾎｼm smaller than that of large synchrotron radiation. The field of use is diverse. New! English version site was renewaled. 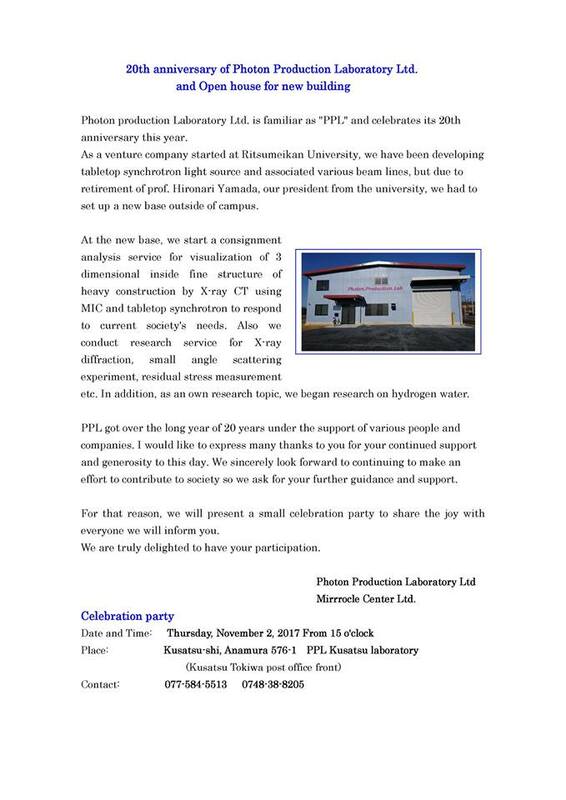 We held a celebration party the 20th anniversary of Photon Production Laboratory Ltd. at Anamura laboratory welcoming 60 guests to 11/2. PPL celebrates its 20th anniversary this year. For that reason, we will present a small celebration party to share the joy with everyone we will inform you. We were given X-ray CT inspection of engine block.As well as the internal structure of a engine block, you can see a position and the shape of voids in a casting at first sight. This CT imaging took only 30 minutes. We updated our present condition page of Facebook. We will be exhibiting at the 7th Non-Destructive Evaluation TOKYO, held at Tokyo Big Sight from July 22 to 24. Our booth is 2F-03, located at East No. 2 Hall. We look forward to seeing you there. Our affiliated company, Omi mirrorcle center LLC, has been renamed as Mirrorcle center Co., Ltd. as of May 13, 2015. We exhibited at the 2nd Metal Japan (Highly-functional Metal Expo), held at Tokyo Big Sight from April 6 to 8. We would like to thank those of you who visited our booth. Click here for the exhibition poster. We have been commissioned the inspection of a dismantled bridge by the Public Works Research Institute located in Tsukuba. The work was successfully completed using our MIC1 model magnetron. We have been commissioned the inspection of a turbo engine by an automobile manufacturer. We have released the MIC1 model magnetron. Although lightweight (300 kg), it is more powerful than a klystron. A MIC1-CT system was delivered to a major corporation in Osaka, along with a shielding chamber. This is a 1 MeV microtron that can generate X-rays capable of penetrating 15-cm-thick steel; besides, it can achieve a spatial resolution of up to 0.3 mm. Both the penetration and resolution capabilities are vastly superior to those of conventional electron accelerators, bringing X-ray CT into a new era. A MICROTRON resolution of 0.2 mm was experimentally demonstrated - refer to the image here. We have received a purchase order of MIRRORCLE-CV4 from Hitachi, Ltd for X-ray CT.
New Fantastic fine resolution X-ray CT images and movie of industrial products are uploaded. New X-ray CT image and movie of industrial products was uploaded. Fine X-ray CT image of Li ion battery was taken. "MIRRORCLE type tabletop synchrotron light source realizing micron-order focus point"was accepted by X-ray spectrom. 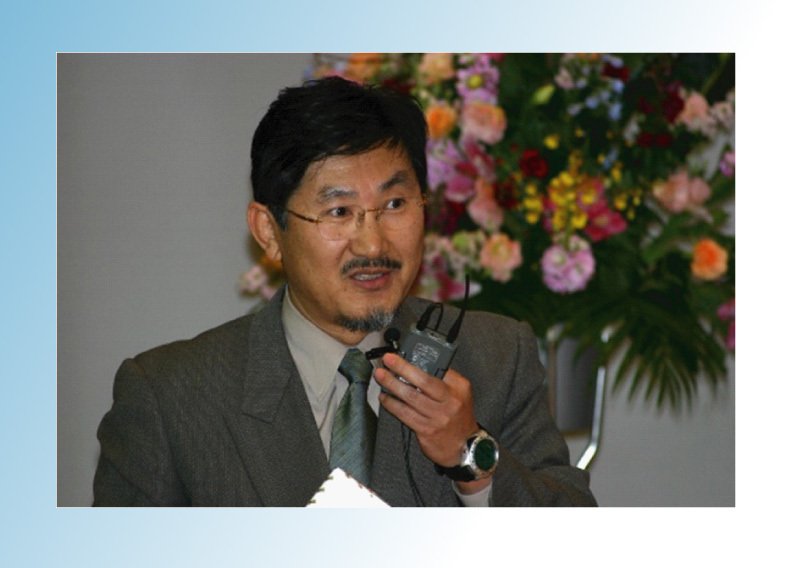 Dr. yamada gave a talk on "MIRRORCLE" @Korea Basic Science Institute. Dr. yamada gave a talk on "MIRRORCLE" @ KyungPook National Univ in korea. We start analysis service of X-ray reflectivity measurement. The corporate pamphlet was renewed. The beam injection of MIRRORCLE was carried at 1KHz repetition, with 100ns timing window, and 300mA peak current. This time we anownce that we have developped 300MHz continuous beam injection. We can provide 10^10 photons/s/mrad^2/0.1%bw with 10KW beam power microtron injector. We send our deepest condolences and our support to everybody sacrificed in the Tohoku Kanto Earthquake and Tsunami sincerely. The relief and condolence money from PPL and Kwang San Co.,Ltd. (partner company) in Pusan KOREA was delivered to Japan Red Cross through the Kusatsu City social welfare section. Turbine blade CT imaging of the world highest resolution was achieved with MIRRORCLE CV4. An internal structure of a large-scale lithium-ion battery is observed clearly. Sheath steel lumbe was observed within a 600mm concrete. We release new english brochure. J. Synchrotron Rad. (2009). 16　”Performance of the far-IR beam line of the 6 MeV tabletop synchrotron light source”　MIRRORCLE-6X Far infrared power is comparable to the UVSOR coherent Synchrotron radiation. We release MIRRORCLE-CV4 total Photon Flax. You can perform advanced X-ray analysis. Monochromatic X-ray intensity from MIRRORCLE 20SX is advanced by one order than that from 1kW X-ray tube. Copyright © 1997 Photon Production Laboratory, Ltd. All rights reserved.